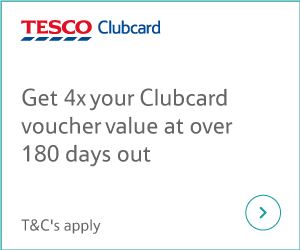 How to increase the value of your Tesco Clubcard vouchers by up to 4 times! If you shop at Tesco and don’t already have a Clubcard then I suggest you sign up for one. Not only can you save money on your favourite products, but you could also save heaps of money when shopping with a whole range of Tesco Clubcard Partners. Every 3 months (after you collect 150 points) you will receive a Clubcard statement telling you how many Clubcard vouchers you have earned. You can choose to use your Tesco Clubcard vouchers in-store or online for your food shopping or you can boost them to make them go a whole lot further. 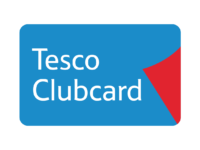 You can increase the value of your Clubcard vouchers by shopping with one of the Tesco Clubcard Partners. You could actually ‘boost’ the value of your voucher by up to 4 times! Shopping this way could help your family save money on days out, entertainment, meals and transport – perfect for the summer holidays. How do I save on family days out using my Tesco Clubcard? I found the website really easy to use. Once you choose which category you want to buy from (Fun, Eating Out, Travel, etc) you can search using your location or just browse the whole range. What sort of deals are offered by Tesco Clubcard Partners? The whole family can have fun this summer. There over 180 attractions and hundreds of restaurants where your vouchers are worth 4x their normal value. These include museums, zoos, wildlife parks and sightseeing tours. I have hunted through the site to choose my five favourite Partner offers guaranteed to keep everybody entertained. If you’re family loves taking the train as much as I do then a Family & Friends Railcard is a must buy! For £15 worth of Clubcard Vouchers you can purchase one of these money-saving railcards (normally £30) valid for one year. You could save 1/3 of the price of adult fares and get 60% off child fares when up to 4 adults travel with up to 4 children. Eating out is a real family treat and Tesco Clubcard Boost makes it a lot cheaper. For every £2.50 of Clubcard Vouchers you have, you will get £10 worth of restaurant vouchers – that’s 4 times the value! You could have unlimited access to over 400 historic sites by using your Clubcard vouchers to purchase an English Heritage Annual Membership. Exchange £16.50 worth of vouchers and get Adult Annual Membership (normally £52) or£30.00 worth of vouchers and get Joint Adult Annual Membership (normally £92.50). Up to 6 kids (under 19) go free so this is an excellent way for the whole family to see sites like Stonehenge, Hadrian’s Wall and the home of Charles Darwin. If you or your loved one is a theme park junkie then this is the perfect way to spend your Clubcard vouchers. For £50 worth of vouchers you can get a Merlin Annual Pass valued at £169. This allows unlimited entrance into attractions like Alton Towers, the London Eye, LEGOLAND and Shrek’s Adventure! London. Visiting farms, wildlife parks or Wookey Holes are fun ways to spend family days out. 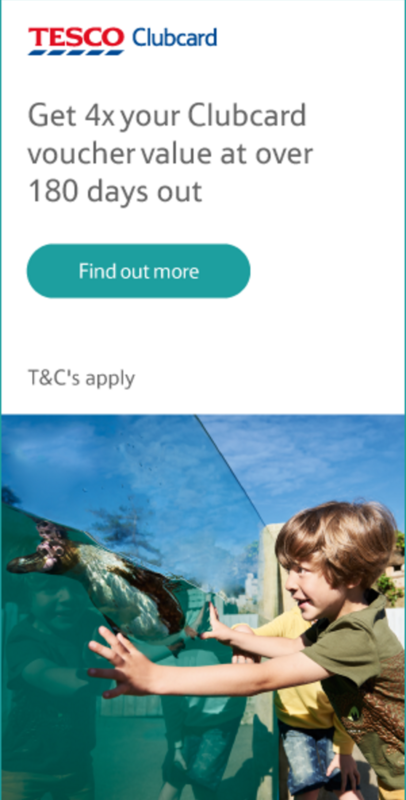 Tesco Clubcard Partners include Birdland Park and Gardens, London Zoo and Stratford-Upon-Avon Butterfly Farm. Every £2.50 worth of Clubcard Vouchers you spend will get you £10 towards the price of entrance costs. Boosting your Tesco Clubcard Vouchers will give you a little help entertaining the family this summer. If you’ve already got a Clubcard then have a browse of the Partners offers to see how you can save money – I’ll be doing this rather than getting £2.50 off my weekly shop! And if you don’t already have a Clubcard – what are you waiting for?